KiiPix Smartphone Picture Printer is the easy and portable way to let the fun last forever. Making real memories with real pictures has never been easier than with the KiiPix photo printer. Open up your KiiPix, place your phone on top, push the button and turn the crank. The picture rolls out and you have a forever memory to keep or share. The only hard part will be choosing which pictures you want to print! KiiPix puts you in control. SMARTPHONE PRINTER: Instantly print favorite photos from your smartphone. It’s easy to use: Place film, place phone, and print! 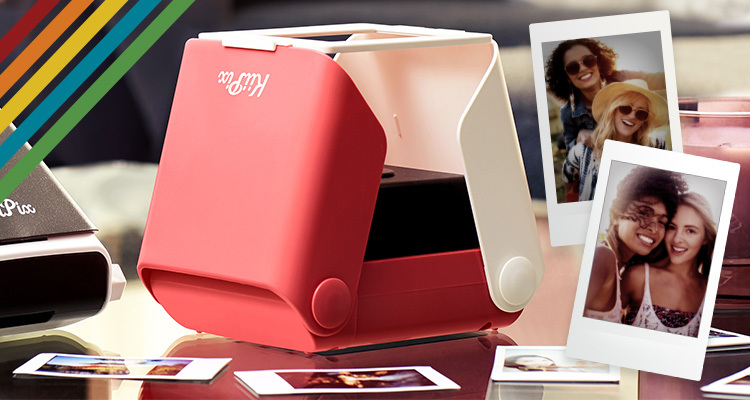 PORTABLE PHOTO PRINTER: No batteries or cords required. Take it anywhere! It’s compact and folds flat for easy travel. PHOTO SCANNER: Add fun filters or just get rid of the red-eye and then use KiiPix to scan those photos right to the film. You can easily print your pictures to hold on to! NO INSTANT CAMERA NEEDED: The KiiPix only requires FUJIFILM Instax mini film (sold separately) and your phone to provide you with fun prints. THE BEST PICTURES: For the best pictures, make sure your screen lock is on and that you turn the phone’s brightness all the way up. THE PERFECT SIZE: The credit-card size pictures produced by the photo printer are the perfect size for wallets. Photo Size: 3.4 in. x 2.1 in. and Image Size: 2.4 in. x 1.8 in. What kind of film does KiiPix use? KiiPix requires FUJIFILM Instax Mini Film. Does KiiPix come with film? No, FUJIFILM Instax Mini Film needs to be purchased separately. What size photos print with KiiPix? FUJIFILM Instax mini film prints are wallet sized, 3.4 inches x 2.1 inches. Do I need batteries or cords to use KiiPix? No, no batteries or cords are required. Will KiiPix work with phones that have screen protectors? Yes. KiiPix works with phones protected by premium glass screen covers. Lower quality screen protectors can affect print quality. Best results are achieved with no screen protector. My picture rotates/my screen goes dark or I got a phone call/notification when printing. How do I prevent that? Turn screen lock on to prevent screen rotation and turn off auto-lock settings. Turn phone to airplane mode or “do not disturb” when printing to ensure a call or notification does not come through. 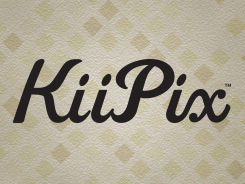 What kind of phones work with KiiPix? KiiPix will work with any phone that fits on the frame. Phones that have a smaller screen size than the KiiPix print area will have black areas where there is no image to print. What should I do if my pictures are turning out too dark, too bright, or showing white lines or spots. Check that your phone's brightness is set to maximum. Try increasing the brightness and contrast of the picture. Ensure you print your image with one press of the shutter button and turn dial quickly without interruption. Try keeping the print face down when it first comes out to reduce the possibility of over-exposure. If white lines appear they will normally disappear between 20 minutes and 2 hours as the photo continues to develop. What should I do if my pictures are jammed or have stopped coming out? Check to make sure you have not run out of film. On the reverse side of KiiPix is a small number window that shows how many prints are left. If the dial shows “S” you have run out of prints and will need to replace the cartridge. Turn the dial clockwise until you feel a “bump”. Turn only until the film is released. Try turning the dial while holding the KiiPix directly in your hands instead of on a table. This will give you more space to rotate the dial.